Spring is the perfect time of year to improve a home’s curb appeal. Chances are there are a few things that will need repaired after a long, hard winter, and as these items are fixed, the homeowner has an excellent opportunity to create a beautiful exterior for their home. The roof of the home can be seen by all that pass by. Every homeowner should be inspecting their roof each spring. It is best to catch any damage caused by the winter weather before it becomes a huge problem. Many roofing companies will do this for you. They can make suggestions as to what can be repaired and what issues will require a new roof. 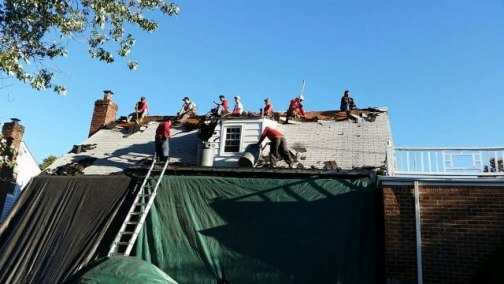 If you need help with residential roofing NYC has many specialists available to help like those at Installation Service & Repair, Inc.
Spring is a wonderful time for homeowners to walk around the house and see what needs spruced up. This often means that the paint needs touched up. Trim around windows and doors can take a beating during harsh winters. They often need scraped and repainted. If the damage is extensive, it can be the perfect time to change colors on the exterior of the home. Choose hues that coordinate with the existing siding. Doors can be painted in a striking color to create interest. Each year the flower beds need cleaned and mulched. This is basic maintenance that doesn’t cost a lot, but it does make a home look amazing. Trim bushes and shrubs that are starting to get out of hand, and remove dead flowers and plants from the year before. Add to perennial favorites with colorful annuals, and use a hanging basket on the front porch to continue the look. If the home does not have a porch, a shepherd’s hook next to the front door is ideal for hanging baskets. Window boxes provide a place to add florals to small front yards. These few simple upgrades and repairs can add curb appeal to any home. A new roof, fresh paint, and lovely landscaping makes a home look and feel welcoming, and it will increase the property’s value as well as bring pleasure to all that live there.